Littlefield sometimes limits bookings to 999 or more days. Buttermere sometimes limits bookings to 999 or more days. Superior room with small seating area and combi TV. Newly, completely refurbished. Derwentwater sometimes limits bookings to 999 or more days. Superior double/twin en suite room, newly refurbished. Grasmere sometimes limits bookings to 999 or more days. Double room. 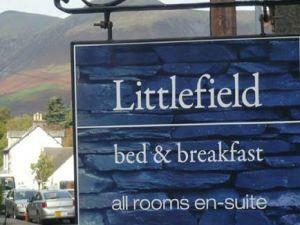 Double aspect room with views towards Latrigg and Skiddaw. Room has shower incorporated. Newly refurbished. Rydal sometimes limits bookings to 999 or more days. From A66 travelling west take 1st turn for Keswick. Follow signs down into Keswick and look for left turn into Greta Street, immediately after Keswick conservative club. Continue over 2 crossroads, road then becomes Eskin Street. Very enjoyable stay in Keswick. Our dog was welcome. The owner provided us with excellent suggestions for walks from the B&B with accurate routes and timing. We will definitely stay here again. Special diets can be catered for by arrangement. We are a very small, Victorian end terraced Bed & Breakfast which is unsuitable for those people with disabilities.